32oz Medium Chain Triglycerides. USP Grade. Kosher. 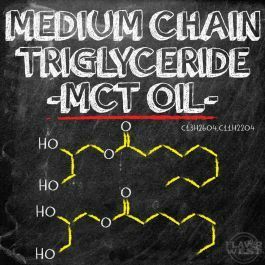 Caprylic/Capric Triglyceride, alternatively known as Octanoic/Decanoic Acid Triglyceride or MCT Coconut Oil, is a specialized esterification of coconut oil extracted from the kernel of matured coconuts. This oil uses only the medium chain triglycerides, namely Caprylic Acid and Capric Fatty Acid, contained in raw coconut oil. The result is an ideal carrier oil that can be used in a variety of applications. Flavor West provides quality Caprylic/Capric Triglyceride, produced using ethically sourced supplies. · Personal Care: Commonly used as an emollient, Caprylic/Capric Triglyceride serves as a replacement for White Oils and Petrolatum in makeup, moisturizers, skin care and sunscreen products and perfumes. Within this application, Caprylic/Capric Triglyceride serves as an excellent choice for sensitive skin products due to its lightweight nature and compatibility with most skin types. · Pet Food: MCT coconut oil can be used as an ingredient in pet foods, and research does suggest the inclusion of MCT oil has positive effects on feline metabolism and canine cognitive function. · Pharmaceuticals: Caprylic/Capric Triglyceride is an efficient solvent and excellent excipient, meaning it can act as a carrier or suspension medium for oil soluble antibiotics, drugs and vitamins. · Food and Beverage: Caprylic/Capric Triglyceride is promoted as an energy supplement and digestive agent in the food industry. It’s commonly used as a food emulsifier. · Flavor and Fragrance: Caprylic/Capric Triglyceride is an excellent carrier for both fragrances and flavors, as it’s a low-odor oil. · Nutraceuticals: Caprylic/Capric Triglyceride is itself an energy supplement and digestive agent, promoting metabolism boosts. It's also an excellent emulsifier and solvent and can act as a carrier or suspension medium for oil-soluble vitamins and minerals. Within these applications, MCT is a low-hazard chemical, posing little to no risk to health and safety. Bulk Caprylic/Capric Triglyceride is very stable and has a long shelf life. For storage, keep Caprylic/Capric Triglyceride in a tightly sealed container protected from moisture, heat and direct sunlight, as oxidizers and elevated temperatures can degrade the quality of the product. In such conditions, it can be feasibly stored for up to 48 months, though we recommend using it within three years. The Caprylic/Capric Triglyceride SDS is available for download at the bottom of this page and contains detailed safety, handling and storage requirements for our products.